Driver distraction from use of cellphones remains a tremendous problem nationwide. And it’s not just voice conversations that are problematic. According to a recent Pew Internet and American Life Project study, some 27 percent of adults and 26 percent of driving-age teens in the U.S. say they engage in “texting” while driving. At the same time, services like OnStar and Ford’s SYNC have made cellular connections in the car a valuable safety feature. With just a push of a button, these services make it easy to call up assistance from a live operator in case of an emergency–or merely to get driving directions. So how about blending these concepts to put an end to cellphone distraction? That’s the idea behind a new suite of new command and communications technologies that Ford is rolling out later this year in vehicles equipped with the new MyFord Touch and MyLincoln Touch user interface, beginning with the 2011 Ford Edge and Lincoln MKX. 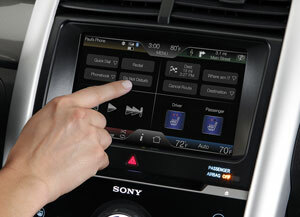 That’s the idea behind a new Do Not Disturb function that Ford is rolling out later this year in vehicles equipped with the new MyFord Touch and MyLincoln Touch user interface, beginning with the 2011 Ford Edge and Lincoln MKX. It’s part of a suite of new command and communications technologies to be added to SYNC in coming months that shield against using features that aren’t voice-activated while the vehicle is moving. The Do Not Disturb button will be the most useful for all drivers out of the gate. It lets users choose to block incoming phone calls or text messages before they reach the connected cellphone, diverting calls to the user’s voice mail account and storing text messages on the phone for viewing later. Outgoing voice calls are still allowed as long as they’re made with SYNC’s voice-activated dialing or are to Ford’s SYNC 911 Assist emergency service. And having a technology built in to a car is always our preference, because it allows for greater integration with other car functions (such as the audio and navigation systems). However, the Do Not Disturb feature takes an opt-in approach, relying on the driver to consciously select it each time the car is started, rather than making it an automatic safety-enhancing technology. By contrast, similar cellphone apps do act as automatic safety nets, instead forcing drivers to opt out and choose the possibility of distractions. Finally, going forward Ford will adopt a new kind of Bluetooth technology that theoretically will expand SYNC’s ability to work with a broader array of cell phones for reading aloud email, text messages and multimedia “MMS” messages that may include pictures as well as text. But Bluetooth Message Access Profile or MAP has not been widely adopted by cellphone makers. Only BlackBerry maker Research In Motion–a Ford partner–is planning to adopt MAP in all future models of its smartphones. While these latest changes certainly are a move in the right direction to make roads safer, there's room for improvement.